Berry Bros. & Rudd Spirits has announced the third release from its first series of single cask bottlings from the late 1960s and early 1970s; The Glenrothes Extraordinary Single Cask 1968. This latest release has been bottled from the contents of Cask #13507 – a second-fill hogshead cask, filled on 19th November 1968, which has yielded just 145 bottles at a natural strength of 41.9% ABV. With a growing demand for more, older, rarer bottlings, Ronnie Cox, Brands Heritage Director at Glenrothes, has for the last two decades, undertaken the lengthy process of assessing and identifying a small reserve of casks deemed worthy of being included in The Glenrothes Extraordinary Cask Collection. The Single Cask is something that The Glenrothes bottle only rarely. Just occasionally, casks are discovered with such distinguished personality that they can stand alone as examples of supremacy of the bloodline. Presented in a hand-blown lead crystal decanter, each bottle comes with a polished brass plaque, engraved with the year of distillation and the bottle number to ensure the uniqueness and authenticity. Described as being like Glenrothes in its spring-like idiom on the nose and text-book Glenrothes creamy on the palate, this latest expression is unchillfiltered and like all Glenrothes bottlings completely natural in colour. 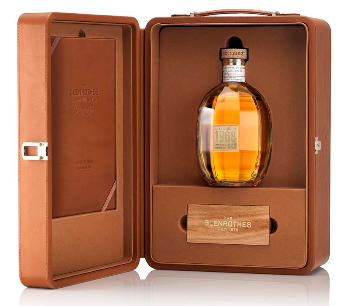 The Glenrothes Extraordinary Single Cask 1968, will be available exclusively at DFS at Singapore Changi Airport during February. It will then be available in selected domestic outlets across South East Asia and in the rest of the world for a RRP of £5,500.